It's a little over a week since we got back from our first big comic con of the year, MCM London. This year our convention plans are fairly limited as a result of other financial commitments, with the two MCM London conventions in May and October being our only concrete events. They were the first cons we ever attended, and are responsible for our joint enthusiasm for cosplay. We've only missed it once since we first started attending in 2014, and it's the event I tend to plan my bigger costume projects around. It's also the place where we met most (if not all) of our close cosplay friends, so we always look forward to it, not only for the event, but for the social aspect too. 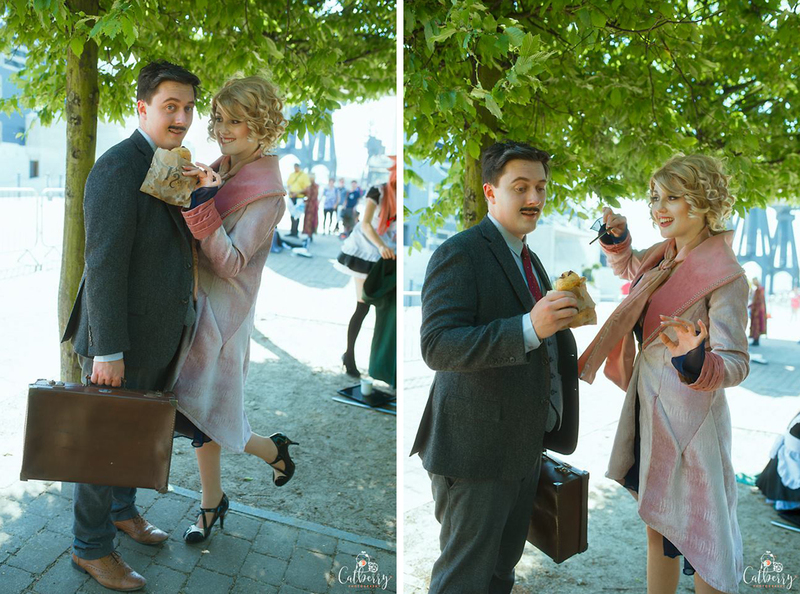 Our first cosplay of the weekend was a joint project; Queenie Goldstein and Jacob Kowalski from Fantastic Beasts and Where to Find Them. We have done a few couple cosplays in the past, however this was our first time doing a non-Disney pairing together. 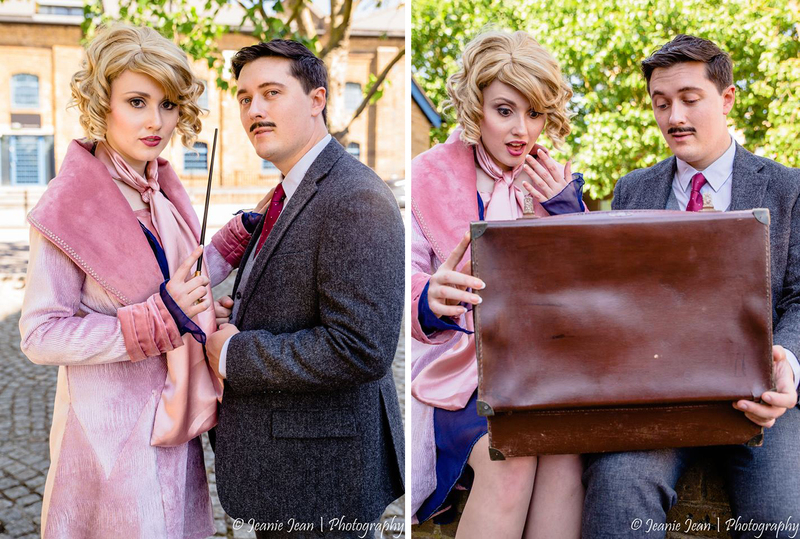 When we first saw Fantastic Beasts at the cinema we felt an instant affinity for them as a couple, and on the walk home decided that we had to make a cosplay happen. 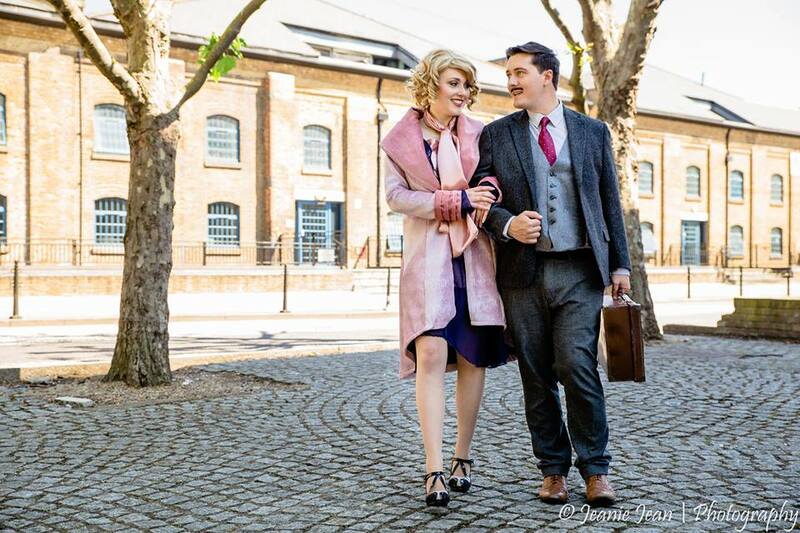 In December I began looking into fabrics for Queenie's coat, and immediately fell in love when I found the pale pink upholstery velvet I ultimately used. It was quite expensive and there was a very limited amount available, so my family generously bought it for me as a Christmas present. It has a beautiful swirl/wave pattern embossed in it, and as it's velvet it really shimmers under light. Another Christmas present was my Queenie wand, which Grant ordered shortly after we saw the film. With my main fabric and prop in hand, I started 2017 feeling optimistic about the task ahead. In Jan/Feb I started slowing obtaining my materials, however I didn't start working on the costume until later in March. I started with the coat, drafting my pattern based on a combination of the Hot Topic version and the screen version. I made a mock up, then tentatively starting cutting into my velvet. I lined it in navy blue satin, added the collar and cuffs in raspberry pink velvet, and embellished the collar with tiny glass beads. 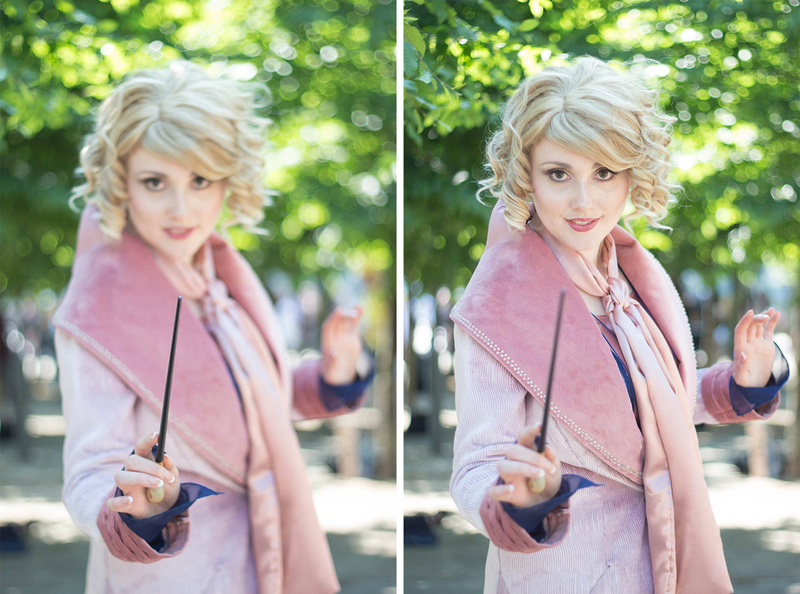 I also added a wand pocket, partially for practicality, but also because I loved revealing my wand with a flourish! The dress isn't seen much in the photos, mainly because the coat turned out to be one of my favourite garments I've ever made and I refused to take it off until I was close to passing out from overheating! However there was still a lot of thought involved. I patterned the slip and dress myself, and spent hours beading the wrists (unseen) and the hem of the skirt. I ended up using thousands of tiny navy blue beads, however they definitely aided in giving the skirt weight and movement. I used a chiffon for the dress, however in hindsight I would have chosen something slightly less sheer. The wig and shoes required a little thought but came together quite easily. I found the base wig on eBay, and all it really needed was a tight pin curl. The base black heels I used were also found on eBay, then I spent an afternoon turning them into Queenie's with some beige faux suede and a sheet of black patent fabric. They were not comfortable, so I plan on giving a pair of black character shoes the same transformation before I wear Queenie again. Grant's Jacob costume came together quite effortlessly; the jacket and trousers were found in Oxfam, and the vest was found on eBay. We purposefully looked for items that looked old, worn, and passed down. The vest was a bit small, however the colour and fabric were so perfect that I spent an evening cutting off the back entirely and replacing it so the fit was more appropriate. He managed to find his moustache and tie on Ebay, and already had appropriate shoes. For Jacob, the biggest project was the suitcase. When visiting my parents I spotted a slightly tired looking suitcase being used as decor and asked if I could borrow it for a costume, on the condition I returned it in better condition than I 'd borrowed it. My mum obliged, on the condition it would eventually be returned as it's a bit of an antique and she's quite fond of it. Once it was in our possession we polished it up slightly, and added some brass caps to the corners as it didn't have any and was looking a bit tatty at the edges. At the con we used it to carry our cosplay emergency makeup/repair kits, along with some fresh pastries in Kowalski Bakery branded paper bags for photos. 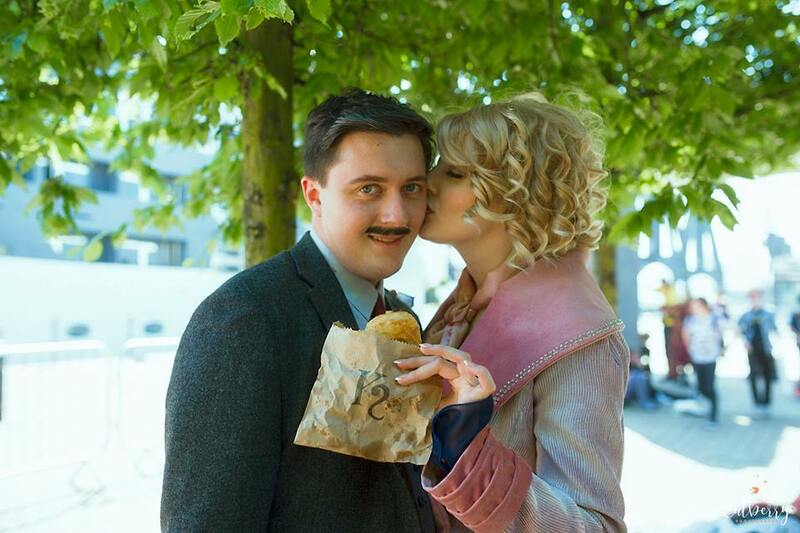 This was our first joint cosplay in over a year, and we had such a fun day as this couple, connecting with other Fantastic Beasts/Harry potter fans and nibbling on pastries. We wore them on Friday, which is typically the quietest day of the convention, so despite it being swelteringly hot it was fairly laid back. 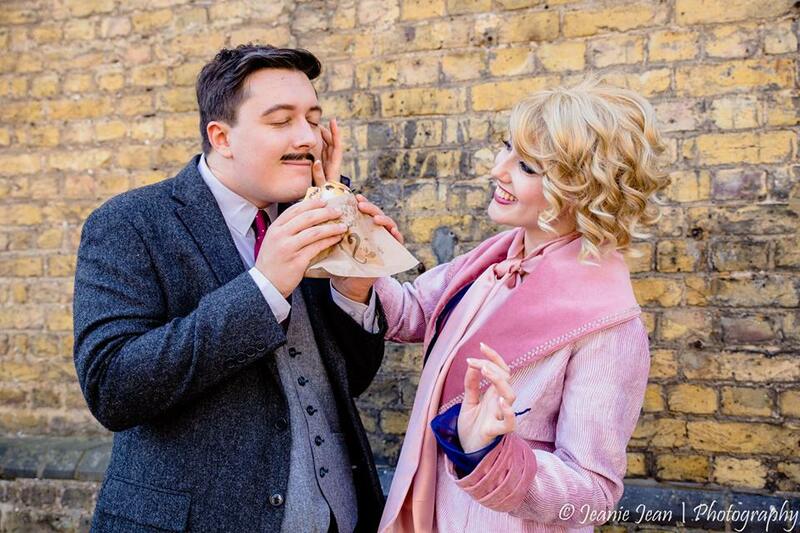 Queenie and Jacob got a great reception, with so many lovely photos being taken throughout the day, and we've already had quite a few people ask us to bring them back for future events (spoiler - they will definitely be back! ).